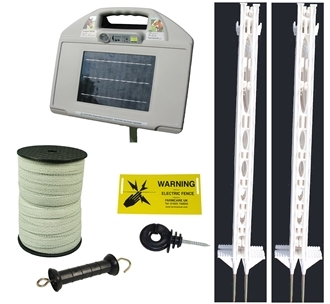 The AS20 solar energiser comes complete with a battery and is exceptionally easy to use. Powers up to 2Km of multi-wire fencing. Solar power operation is ideal for remote locations or permanent installation on small farms. Built-in solar panel charges battery, even on cloudy days, for reliable performance. 4x ring insulators These are for finishing off the fence to a tree or fence post. If you select Kit Color GREEN we will change the posts to GREEN and also change the tape / rope to GREEN all the rest of the Kit will remain the same. tape or rope connectors - please don't tie knots in your tape or rope because it will weaken the fence. If you have any questions, please don't hesitate to call. We are always happy to help.